I am using Geonames for my analyses and there are a lot unknown regions (and even when looking with other names I can't find them). When it comes to zip codes or cities I can complete the data of Tableau by using my own latitude and longitude. In this case they are just points on the map. Here I also want the shape of the region and I didn't find any shape data for those regions (I'm not even sure how this would work). I only get two little tiny dots because I am missing the shape. (Note that in this case Kanton Appenzell Innerrhoden actually exists in Tableau under the name "Appenzell Inner Rhodes", normally I have a function that takes care of that but I wanted Tableau not to recognize it for the example). I am not very hopeful that there is a solution for this but I am posting this anyways. Maybe Tableau could add some data or maybe I missed something, who knows. On the Cornwall one...does your country field show it in the United Kingdom or England? Can you please check that which country you have selected in this option.? Please select country and then start creating map report. Bring Longitude and Latitude in the sheet and then right click in the sheet. Where you'll get "Edit Locations" Option. then select country which ever you want. Thanks to everyone for your answers . I took some time to export a .twbx with all regions from Geonames. I made sure all the countries were recognized and used a little trick so that you can see all the regions that are not detected. Very cool...and nice use of filtering! What you can do (although if you have a 3rd level I'm out of ideas!) is to create a copy of Region, I've then renamed it County and set it be county geographic type. I then create a second axis, place this in the level of detail (so this will plot any "regions" that are defined as counties) and then dual axis them. I've made the "county" level ones Red, so you can see what it's doing. WOW very nice! Did not think of doing this. So in the case of regions analyses I have not planned to use a dual axis yet so it is alright. And nice catch by the way I did not mention that I set United Kingdom to a more detailled level. Because "England" or "Ireland" is a bit large for me . I checked my code for downloading Geonames data again and it is the only exception. Field name = "Region (as county)"
So one way I can think, if you want to look at different levels (as Tableau sees them) of geography together, would be to build up your data (looks like you have good system of easily selecting and regenerating levels!) from the lowest level you need (in this case county), you can then bring in the level (as a field) that you actually want. So in the case of the UK, counties would all be their county name, but in the case of USA, every "county" for a region (say California) would have the name California. This may cause more problems than in solves, as I'm not sure if Tableau goes down to county for every country...just a thought. Sorry but I don't really get it. Using the menu in your screenshot creates a hierarchy (from region to country btw which does not make sense ?!). In this case it makes my map almost completely blank (note that I have modified the field "Region (as county)" it is an identical copy of Region with "county" as geographical role). So I've probably not explained either very well! On the dual axis one you don't want both Region and County (just county) as Tableau looks for UK (country), Cornwall (state/province), Cornwall (county) and says that is not a combination I know, but when you use just Country and County is says "oh I know a county called Cornwall in the UK"! Tableau doesn't build it's geo-mapping from just a single name, it uses all levels it can find; So "New York" alone won't plot, is needs "USA" -> "New York". Which means that Although "UK" -> "England" -> "Cornwall" does exist, "UK" -> "Cornwall" -> "Cornwall" doesn't. Thanks for your answer Simon . Which means that Although "UK" -> "England" -> "Cornwall" does exist, "UK" -> "Cornwall" -> "Cornwall" doesn't. I had never thought about that. On this note I tried setting the region to null when it's UK and "UK" -> NULL -> "Cornwall" also does not exist. I just tried and it does not work (also any other county won't appear for that matter). The dual-axis is also clear to me. How you managed to get Cornwall and California on the same map without the dual-aixs however is still a complete mistery despite the gif. What is in the field "Level I want" ? After that operation there will still be a lot of regions unknown but you have already helped me. 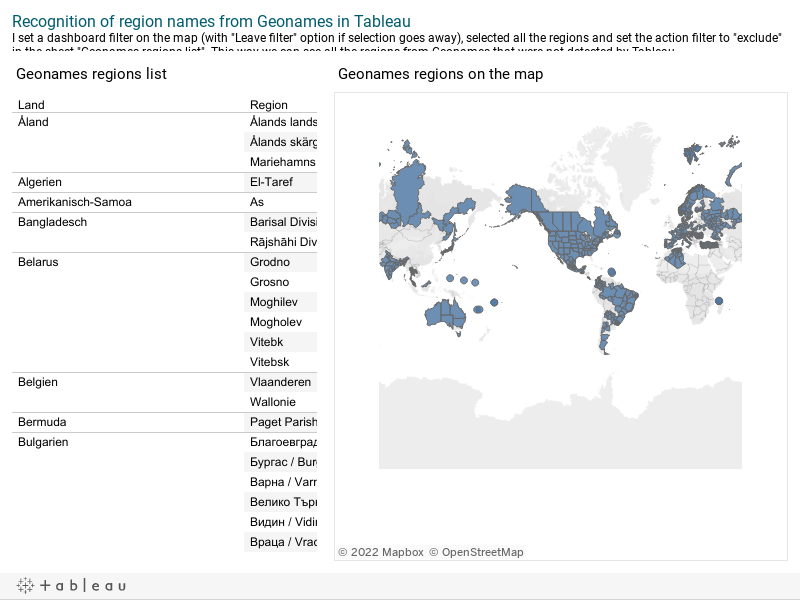 Besides the .twbx allows me to check all values that don't work and I can complete my mapping to automatically rename region and country names to make them compatible with Tableau. So sometimes you just have to rename it e.g. I have replaced "Centre" with "Centre-Val de Loire". But sometimes it just does not seem to exist in the Database Tableau uses (OpenStreetMap apparently). Glad it made a bit more sense! I can then Tableau to Group the County Level to the Management Level, via County...and I can now use this new Management Level as a Geographic data type. I've just got a bit hacky with this feature where I'm saying Group all the California Counties to a level called "California"....but Group Cornwall to Cornwall, Devon to Devon...etc. I finally got it ok! But it means I have to get all county names. I think I'll stick with the dual-axis solution if you don't mind . But I have never using this grouping thing and I did not understand the "create from" thing until now so it could be useful in the future . Not at all! That's the solution I'd go for to. Tableau has different levels of grain and coverage depending on the country you are in (eg. UK, US and Europe is pretty complete, but African counties less so), so when working across countries it can be hard to find a level that works for all. So you'd just not need to find all county names, but also the names that Tableau uses (eg. UK changes it counties from time to time, so you need to know if its the 2013 or 2015 name!) and also know what Tableau defines as a county (eg. the country of England being defined as a province/state! ); Basically it depends how big Tableau is in that country on how much effort they put in to completing the geography! !...India, for example, has got much better coverage over the last year as it's now a big market for them. It is useful to know though, and in my line of work, where each retailer defines their own management-regions it's pretty useful...although since the addition of shapefile support, I tend to just create my own (using QGIS or GeoPanada library in Python) and then use that.